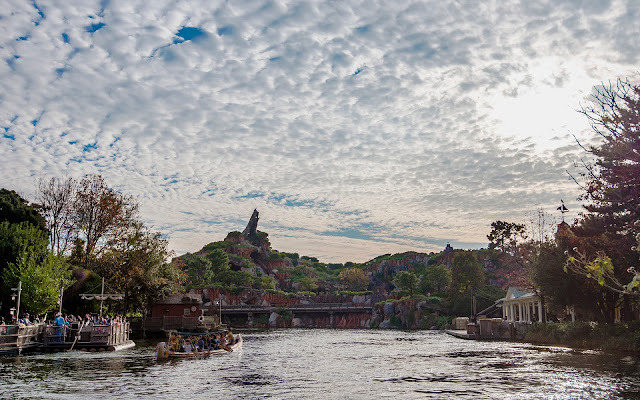 There's a neat little post on the far end of Tokyo Disneyland's Westernland that looks across the Rivers of the West, toward Splash Mountain, allowing two rustic lands to merge together seamlessly in one panoramic composition. This speaks to the depth of thematic layering at the park, something that has always been associated with Disney design. If you think about the way animation works, with foreground, middleground, and background being on different animation plates and moved in different ways as the camera takes each exposure, you'll find similar attributes in this scene. The canoes and river flow forward in the foreground, providing interest and movement to catch the eye. But the background is subtly iconic as well, and the sky beyond that adds rich visual texture to an otherwise empty field. It's almost like the Imagineers dreamed up this scene, and then being that this is wonderful, amazing Japan, controlled all conditions to make this happen just right. ...at least for my camera. Splash Mountain towers in the distance under a dense, cotton candy sky.